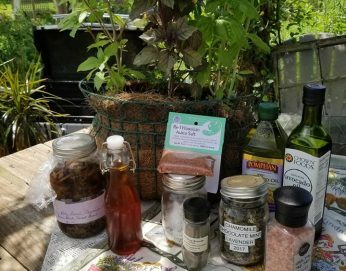 Join Ivana from Lavender ‘N’ Rust Herb Farm at Crabtree Farms to learn all about cooking with herbs. Ivana will demonstrate techniques to create pesto, herbal infusions of vinegars & cooking oils, and herbal seasonings. Techniques for creating herbal salt and herbal tea will also be addressed. Participants will have the opportunity to take home various items created during the class.